As a member of Rotary, you have a Member Profile page on your Rotary Club's ClubRunner site. This page will indicate if you have a valid Rotary Background Check. To access it you must log in with your own personal Login Name and Password. If you do not have one, contact your club secretary. Go to your Rotary Club's ClubRunner Site. Not sure where to access your site? Contact your club secretary. Log on using the Member Login (Upper Right of your Club's home page). Use your own personal Login Name and Password. If you do not have one, contact your club secretary. Go to Member Area(Administration) once you log into ClubRunner. Locate the My ClubRunner Section. 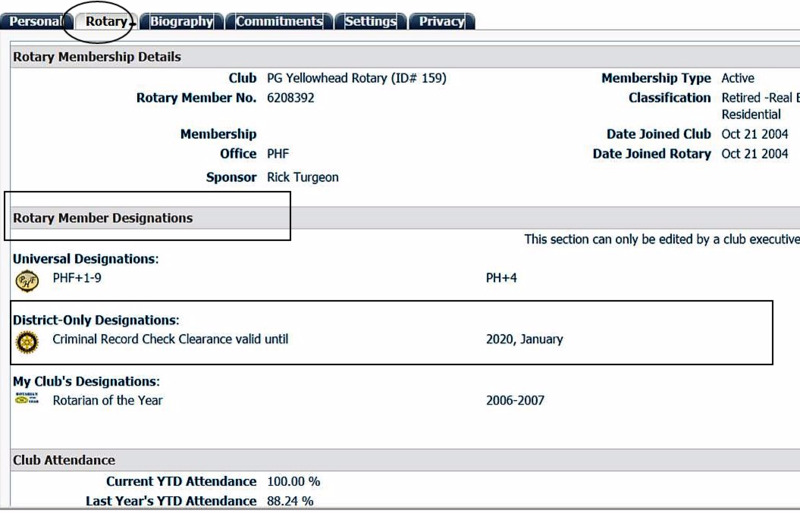 Select the 2nd Tab "Rotary" to view your Membership Details, Rotary Member Designations and Club Attendance. If you have a Rotary Background Check registered, it will appear under Rotary Member Designations.